GREEN QUILTS Update, March, 1998. Turtle Moon Studios. Above: ©1998 Lura Schwarz Smith. "Gaia Series: The Green Man." 52"h x 69"w.
Thanks to Lura Schwarz Smith, of Coarsegold, CA, for the image of her quilt, above. We haven't received many quilt slides lately, but we know the GREEN QUILTS are being made. Please take the time to send yours to the two registries, along with any statements you'd like us to file. "All Creatures Great and Small," the sixth annual Art Quilt Exhibit at the Aullwood Audubon Center and Farm, in Dayton, Ohio, is being held March 7-April 5, 1998. The Miami Valley Art Quilt Network always co-organizes this eco-art event. For information, call 937-890-7360. Right: ©1998 Carol Drummond, Sarasota, FL. "Three Dancers." 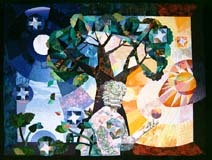 24"h x 42"w. Carol's work, whether quilts, paintings, or dolls, contains an Earth-affirming joy in its spirituality.